half-finished dinners lie hardened on their plates. a bloody battering having sealed her victim's fate. retract in anguish drawing in her pain. contained within this bloodied space. in this empty room that's reached the cruelest place. Great read, it is a striking image and it is definitely inviting bloodshed. Sad story. 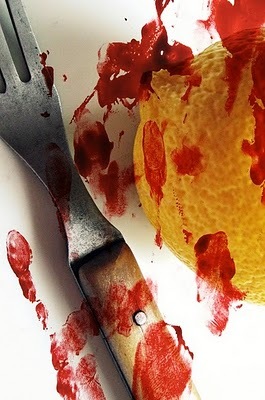 A gruesome picture but a great read. The white dress, the half eaten dinners, the children's side show - brutal and poignant details that carry so much weight, and sadly, truth. "in this empty room that's reached the cruelest place." nice line... such a sad story. Thanks guys, and I'm glad Bug it helped you think of something humorous, I'm intrigued! Does it involve ketchup? Striking imagery, depth of the victim's shattered world, 'the children just a sideshow of a broken union'... just wow. Excellently explored sad piece. 'tonight all players are gone'... what a wonderful line for a heartbreaking poem. great writing! I love the drama in this. Your poem is as striking as the image. I shall have great difficulty excluding it from my mind writing mine. Well done, indeed. This just ripped through me...the violence is real..chilling..
Wow! What an intense poem. Some great lines, in particular: "the children just a sideshow." Great take on the prompt! I could feel those four walls closing in on me. Nicely done. "...in this empty room that's reached the cruelest place." A tragic and powerful write. Excellent!! I can't get that image of the hanging white dress out of my mind. Wondering if she put some bloody hand-prints on it? Powerful poem - I love the rhythm, the push/pull of the edges and the ending that signifies a starting over. Tragic, heartbreaking, frightening.I am always amazed by what a photo can prompt. welcome join poets rally week 39, share a free or old random poem, make new poetic friends, have your work fully represented by the end of the rally..
A very strong poem, well crafted. Thanks guys for all your great comments.